As previously discussed, it is unclear how much of the Northern Zone enclosure system endures into the mid-Roman period (Figure 161). This is particularly true for that part east of Road 1 where only very partially investigated within Excavation Areas G and R south of the watercourse. Given that the subdivision of this area of the settlement is uncertain during Period 3, it is all the more tenuous for the mid-Roman period, with little evidence either supporting or refuting this. 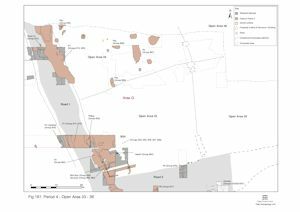 This part of the Northern Zone could as easily have a differing or no subdivision during Period 4, though for ease of reference as much as anything the open areas are retained in the following description. The apparent distribution pattern of pits within OA34 is largely a product of excavation bias - more pits were excavated in the northern part of the area, where they were clearly defined against the brickearth and pre-excavation plans indicate that pits were scattered all across this part of the site (Excavation Area G) (Figure 161). Originally regarded as an elongated pit, it seems more likely that 7270/7389 is the terminal of a north-south aligned ditch. Indeed, the pre-excavation plan suggests a northward continuation toward the edge of excavation. Its southern terminal coincides with the posited perpetuation of the east-west boundary between OAs 33/35 and 34/36 (i.e. former ditch 25041). 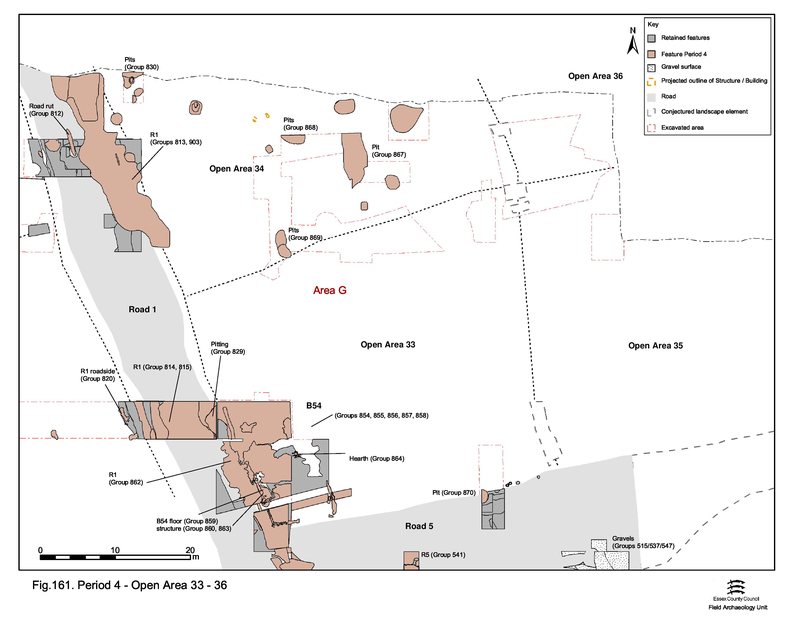 A westward shift of the boundary between OAs 34 and 36 could perhaps be argued. If indeed a Period 4 boundary, it is short lived as mid-Roman pit 7127 would seem to cut it. To some extent, the distribution of mid-Roman pits is a product of the excavation strategy and therefore reflects the selective investigation of remains carried out across Excavation Area G. However, two distinct clusters are apparent. 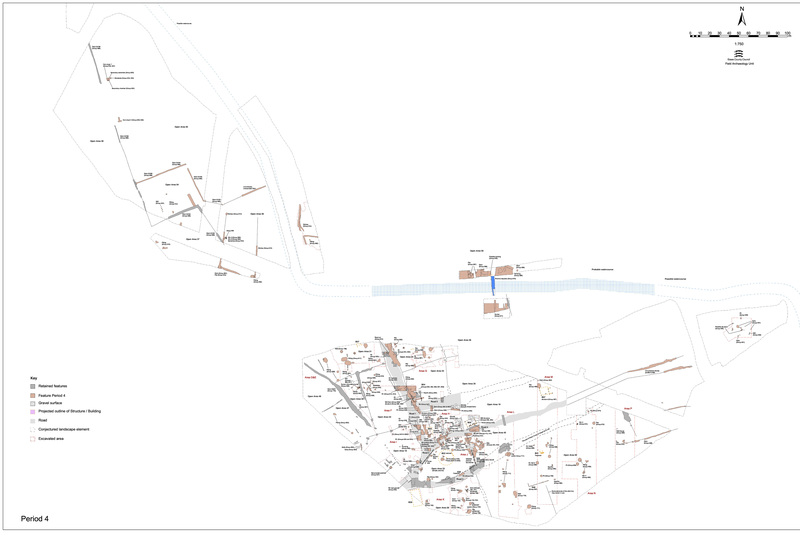 Pits 10086, 10089, 10091, 10162, 10164, 10168, 10195, 10216, 10221 (Group 830) are concentrated near Road 1 at the north-western extreme of the excavated part of the enclosure. Pit 10086 is circular, c. 1.75m diameter, and cuts the latest surface of Road 1, perhaps suggesting the lessening of maintenance along this road in this period. 10091 is a small oval pit, 0.9 x 0.7m and only 0.1m deep, containing a concentration of animal bone, some of which is articulated. It forms part of a cluster of pits with 10164, 10166 and 10168, immediately to the east of Road 1. All of these are relatively small and shallow pits. It is interesting that this location seems to be the site of prolonged pit digging, as a number of Late Roman pits subsequently truncate these. Sub-rectangular pit 10216 contains a distinctive clay fill, into the centre of which a later feature, 10195, is cut. This, in turn, contains a small circular cut 10221. This arrangement of successive re-cuts is similar to features west of Road 1 at the end of Period 3 (e.g. 9007, 9391, 8017, 10023, 10044) and into Period 4 (e.g. 10012, 10020). This recurrent phenomenon, together with the presence of a clay lining, may suggest a primary function other than simply as a rubbish pit. A second pit cluster occupies the eastern part of the enclosure (7072, 7122, 7127, 7248, 7316, 7762 Group 868), on and around ditch 7270. As with Period 3 there are two size ranges apparent: large (over 2.8m diameter: e.g. 7127, 7316, 7762) and medium-sized (1-2m diameter; e.g. 7072, 7122, 7248). Most are 0.3-0.6m deep, but 7316 is significantly deeper at c. 0.9m. Pit 7122 contains large pottery assemblage KPG25 and 7072 a substantial quantity of animal bone. Pits 7284 and 7294 (Group 869) are medium-sized (1-2m diameter) and are peripheral to the eastern cluster, being positioned close to the conjectured southern boundary of Open Area 34. Indeed it is possible that this somewhat notional boundary line, which these pits clip, is by now defunct. 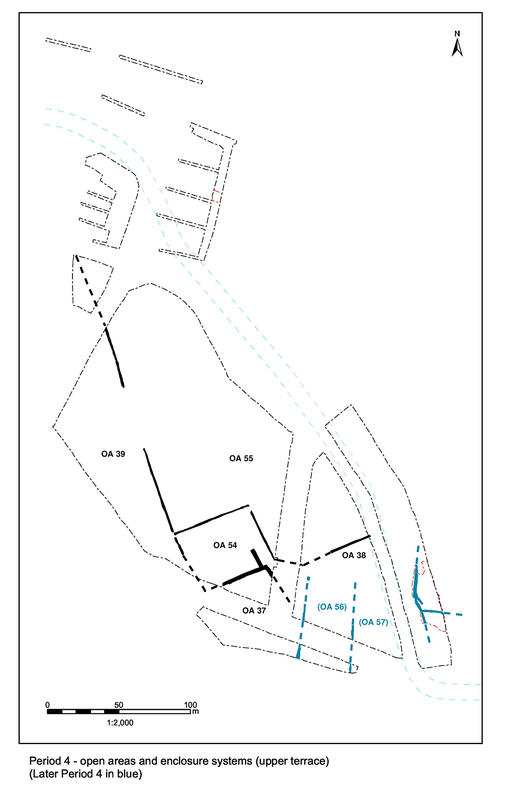 Investigation within Excavation Area G primarily focuses upon the location of Building 54 and the northern part of the area (Figure 161). At least partially as a result, no Period 4 remains are recorded within OAs 35 and 36. 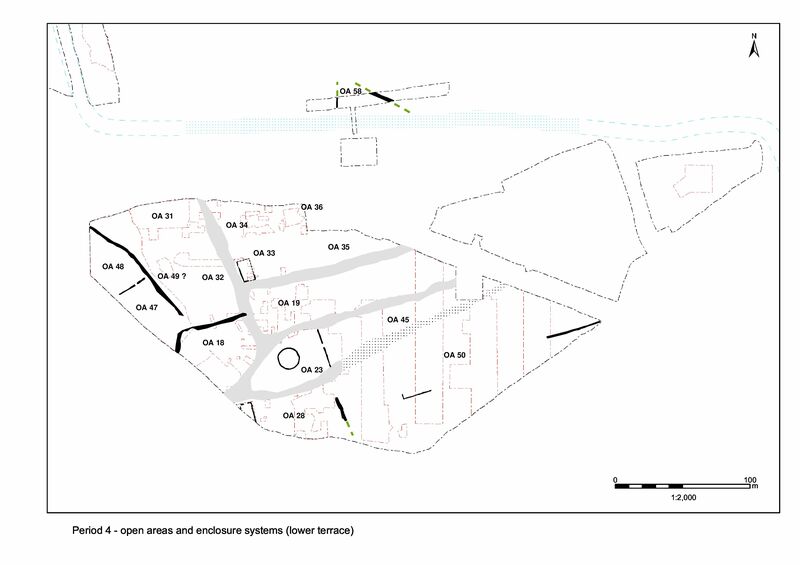 This lack of mid-Roman remains extends to that part of OA36 investigated within Excavation Area R, south of the watercourse, where a genuine absence of occupation activity may be more confidently assumed. To the south of the river, silty gravel layers 12267, 12300, 12349, 12355, 12370 (Group 977) are laid down on top of more-or-less natural brickearths and gravels and above redundant features such as ditch 12284 (ES11 Group 334 Period 2). The uppermost, homogeneous layer 12267 (possibly a re-worked upper portion of gravel deposit 12300) is removed only across small areas, so the true extent and nature remains unknown. A surfacing, or at least consolidating, deposit is postulated and its consistent horizontal level is noted. None of these gravelly deposits are reliably dated. Frequent bone, tile and moderate amounts of pottery were noted at the time of investigation within12349, though none collected.